I hope everyone checks out some of these great products from some awesome manufacturers. I placed orders with 4 of them because of the prices! 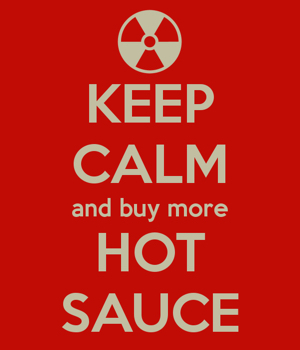 Lucky Dog Hot Sauce has one going on too! Use the coupon “cyber14” and it’ll knock an additional 5% off of anything at http://www.luckydoghotsauce.com today and today only! This coupon stacks with existing bulk discounts, so (for example) you’ll now save 10% on the 3-pack and get the free 4th bottle as well! As a special bonus, every order over $25 received between now & midnight tonight (PT) will be automatically entered in a random drawing on Tuesday to win a Lucky Dog Hot Sauce baseball cap, Dia del Perro t-shirt & Dia del Perro hoodie! As the kids on the Internet say, Woot! Details about the “buy 3, get one free” on my company FB page at facebook.com/luckydoghotsauce (but it’s just like it sounds!) – 1st 50 orders of any size get a chip clip & a keychain bottle opener & the 1st 100 orders get a keychain bottle opener! And since this is a late addition to y’all, I’m extending the Cyber Monday through Tuesday at 9 PM PT for the Hot Sauce Daily crowd. That’s when I draw the winning order #, so get your orders in by then. Awesome, Scott! Thanks and good luck to all who enter!